The Oakland Asian Cultural Center (OACC) has put together a wonderful Fil-Am History & Heritage Series for September through early November. I was honored to be part of the Tribute to the Delano Farm Workers event, Forgotten Heroes of the Delano Grape Strike and United Farm Workers, which took place on Sunday, September 17th. The program comprised the screening of Marissa Aroy’s documentary, The Delano Manongs; a reading from my novel, A Village in the Fields; a display of photographs of farm workers and notable labor leaders by photojournalist Gilbert Ortiz; and a historical perspective by labor expert David Bacon. OACC’s Gloria Fangon-Hitz and Civil Rights activist and moderator Cynthia Bonta put together an impressive program. 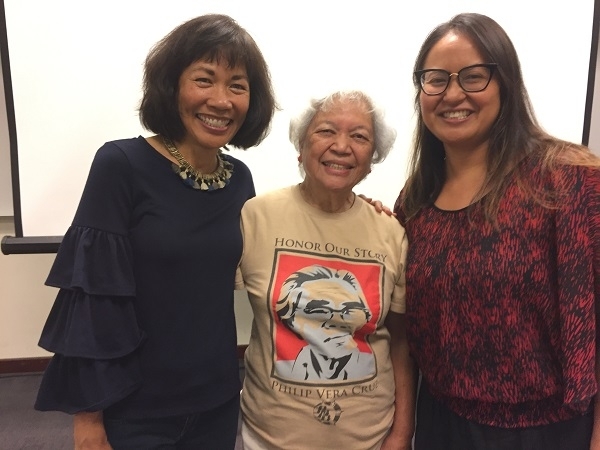 Cynthia, who has a deep history and connection with the UFW, is also the mother of Rob Bonta, California’s first Filipino-American legislator. The discussion was rich and enlightening. 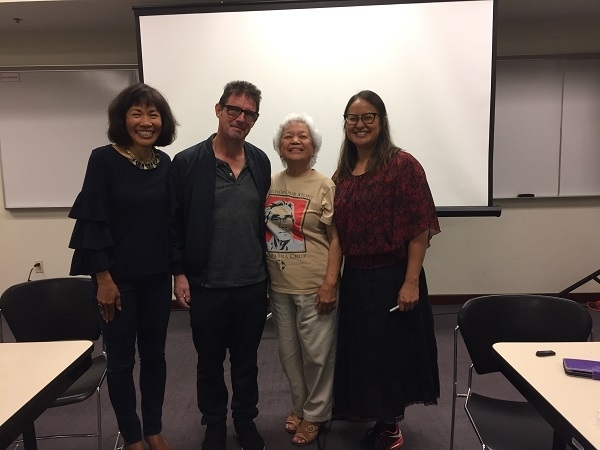 We were graced with the presence of former SFSU Professor of Asian American Studies Alex Fabros, Professor of Ethnic Studies at Cal and chair of the Ethnic Studies Dept. Catherine Ceniza Choy, and my cousin Daniel Toleran and his mother, my Auntie Nora. After the event, me; Niall McKay, director/producer and husband of Marissa Aroy; Cynthia Bonta; and Marissa Aroy. One of the goals of the event, which Cynthia stressed during her moderation and Q&A duties, is to get the story straight, get the facts down, and widely and constantly disseminate the story. It’s a great reminder of what we all try to do every day – chronicling our Filipino-American history, our world, our stories. It’s wonderful to have her as our advocate. We need to be mindful that there’s a young generation who grew up after the Delano Grape Strike and prominence of the Fil-Am labor leaders, that prominent sources, such as the National Archives, are disseminating inaccurate (for whatever reasons) information as fact. Gloria sent the panel this link, which states that Cesar Chavez and Delores Huerta “brought Mexican and Filipino workers together to form the United Farm Workers (UFW).” There is no mention of Larry Itliong’s contributions or any other Filipino-American labor leader. So it is utterly important to keep our stories alive, our documentation of truth continuously in circulation. We have to fight revisionist history and replace it with accurate documentation. As Jose Rizal has been attributed to have once uttered, and many Filipino-Americans and Filipinos recite: Know History, Know Self (No history, no self). Me, Cynthia Bonta, and Marissa Aroy.